2. High Forest with reserves. 1. Irregular high forest to coppice. 2. Coppice to high forest. 3. Irregular to a regular high forest. Pakistan lies between 24° and 37° north latitudes and 61° and 75° east longitudes. It is located in a region where three important mountain ranges meet. The mountain ranges are the Himalaya, Hindukush, and Karakorum. The lessor Himalayan ranges and Hindukush ranges extend deep into the country and form a huge complex of mountains and plateau. Accordingly, 4 out of the 10 highest peaks in the world lie in Pakistan. Physiographically, Pakistan can be divided broadly into two main regions namely plains of the Indus River and its tributaries and a huge complex of mountains and plateaus lying in north and northwestern boundaries. The plains are more or less level consisting mostly of irrigated agriculture and arid, semi-arid deserts. The mountain complex consists of broad valleys, partly irrigated and high steep and rugged mountains and plateaus. About 60 percent area of Pakistan is covered by mountainous complex (Sardar, 1989). More than 60 percent area of Pakistan is arid and receives less than 250mm rainfall per annum. About 20 percent area is semi-arid where rainfall varies between 250-400 mm per annum. In these zones, temperature rises steeply during summer and drops sharply in winter giving rise to great variations in diurnal temperature. Subsequently, the arid and semi-arid parts of the country are characterized by low precipitation, extreme temperatures, and low humidity. These conditions are inhospitable to good plant growth. There are frequent droughts and the plant growth fluctuates greatly with precipitation (Sardar, 2002). 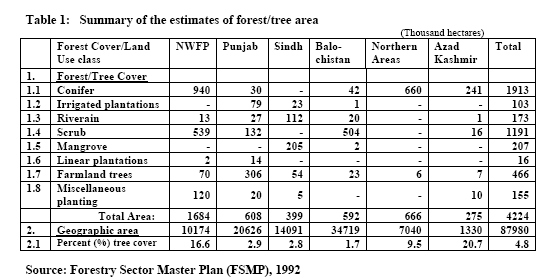 Pakistan has meager forest resources. The country due to its sharp climatic variations and arid conditions lacks reasonable tree cover. There is hardly 4.28 million hectares or 4.9 percent of total area forest/tree cover. Out of it, the productive forests are less than 2% (Amjad et al. 1996). The vegetation type-wise forest cover is given in Table 1. The distribution of forests/vegetation types is primarily controlled by the climatic and edaphic factors. Starting from alpine zones in the north to the coastal belt of the Arabian Sea in the south there are 11 types in the country. Sheikh and Hafeez (1977) have described in detail the Forest Types of Pakistan. The deciduous and small-leaved shrubs including evergreen junipers and sometimes Rhododendron and Ephedra are found. Dwarf prostrate Salix spp. are also present. A good herbaceous flora is met with. The characteristic genera are Salix, Lonicera, Berberis, Cotoneaster, Juniperus, Rhododendron and Ephedra. This type is located above 3800 meters elevation above sea level. Abies pindro and Pinus wallichiana trees in groups with an irregular dense lower storey of broad-leaved trees are found. Betula is typically prominent at the higher elevation in depressions. This is the topmost tree formation in the Himalayas which is found between 3350-3800 meters elevation. The vegetation, as a whole, is xerophytic. The aromatic shrubs namely; Artemisia and some thorny species of Caragana, Prunus, and Rosa are predominant. The forest consists of Conifers mostly having Cedrus deodara, Pinus gerardiana and Juniperus macropoda. Quercus ilex, Pinus wallichiana, Picea smithiana are also present. Broad-leaved trees may include Fraxinus and Acer. Shrubs include Daphne, Lonicera, Prunus, Artemisia, Astragalus, and Ephedra. pindrow, Taxus buccata also occurs. The broad-leaved tree species include Quercus, Rhododendron, Acer, Aesculus, Prunus, Ulmus, Fraxinus, Corylus and Alnus. Xylosoma, Pyrus and many shrubs are also found. The characteristic tree species of this type are Olea ferruginea and Acacia modesta. Pistacia and Punica are also met with. The unpalatable shrubs include Dodonaea, Withania and Rhazya and thorny species like Gymnosporia, Monotheca and Carissa are also associated. This type is limited to the Himalayan foothills and adjoining Siwalik Hills. These are deciduous tree species and include genera’s like Lannea, Salmalia, Sterculia, Flacouria, mallotus, and Acacia. Acacia and Prosopis are strongly represented tree species of this type. There are several genera’s of shrubs: notable are Suaeda, Salsola, Haloxvlon. Calotropis and Periploca. Some of the genera’s of the typical desert are Capparis, Zizyphus, and Salvadora. These forests are man-made irrigated plantations. Dalbergia sissoo as the upper storey and Morus alba as understorey are grown in Punjab and Acacia arabica in Sindh. Other tree species namely Salmalia and Melia are also planted. This forest type predominantly consists of Acacia arabica with scattered tree species like Populus euphratica and Prosopis spicigera on the drier parts. These forests are mostly found along the bank of the Indus River. These tidal forests are found in the Indus delta in the southwestern part of the country. The main species are Avicennia officinalis and Bruguiera conjugata. These forests provide habitats to various aquatic animal species and are of economic importance to the country. A planned process whereby a stand is tended, harvested and reestablished. The system name is based on the number of age classes (see Even-aged, Two-aged, Uneven-aged), and/or the regeneration method used. If you’re planning to harvest trees from your woodlot, a forest management plan can help you achieve the highest economic returns possible and ensure the long-term health of your forest. One of the most important steps in developing a plan is choosing a Silviculture system. Silviculture systems are different approaches to harvesting, regenerating and growing forests. Methods of regenerating a forest stand, and maintaining an uneven-aged structure, by removing some trees in all size classes either singly, in small groups, or in steps. A method of creating new age classes in uneven-aged stands in which individual trees of all size classes are removed more-or-less uniformly throughout the stand to achieve desired stand structural characteristics. A method of regenerating uneven-aged stands in which trees are removed and new age classes are established, in small groups. The maximum width of groups is approximate twice the height of the mature trees, with small openings providing microenvironment suitable for tolerant regeneration and the larger openings providing conditions suitable for more intolerant regeneration. In the Group Selection System, the management unit or stand in which regeneration, growth, and yield are regulated consists of a landscape containing an aggregation of groups. A variant of the Group Selection Method in which some trees within the group are not cut to attain goals other than regeneration within the group. Trees of varying levels of vigor that have their crowns completely covered by the crowns of one or more neighboring trees. Individual trees or groups of mature, unhealthy or other selected trees are harvested periodically. Most of the trees are left to regenerate the stand naturally. Before any harvesting is done, an inventory of the forest is completed. The inventory identifies the tree species, the different sizes of trees, the quality and health of the trees and the availability of habitat in the forest. Based on this information, a tree marking prescription is written and all trees to be cut are marked with yellow paint. Crop trees are usually marked with blue paint. Crop trees are the trees you want to grow for their future commercial value, for their value to wildlife or as sources of seed for regenerating desired tree species. Every eight to 15 years, the stand is thinned to give crop trees room to grow, and some unhealthy and mature crop trees are harvested. Care is taken during the thinning and harvesting operations to avoid damaging the site and the crop trees. Damage to young and old trees can lower the future value of the wood. Road access and a good network of skid trails are important. Good access will improve the efficiency of each thinning and also minimize the damage to crop trees. The selection system can be adapted to encourage the growth of different species. Cutting individual, mature trees in the canopy encourages the growth of shade-tolerant species, such as maple, beech, and hemlock, which are growing in the understorey. Cutting groups of trees, in an adaptation called the “group selection system,” encourages the growth of intolerant species, like poplar, and mid-tolerant species, like oak, basswood, cherry and white pine. The group selection system creates sunny gaps in the canopy where these species can grow. This system maintains a diverse, all-aged forest with a wide range of species of different sizes and ages. These natural looking forests provide continuous supplies of wood, fuelwood, and other forest products, as well as habitat for wildlife and attractive areas for recreation. The selection system is well-suited to the mixed hardwood forests. Mixed hardwood forests rely on small-scale natural disturbances, such as lightning, fire, wind, ice storms, and disease, to kill individual trees or groups of trees and create the space that young trees need to grow. Deodar, Fir, Spruce and Blue pine forest also in some of the chir forest. A method of regenerating an even-aged stand in which a new age class develops beneath the moderated microenvironment provided by the residual trees. The sequence of treatments can include three distinct types of cuttings: (1) an optional preparatory cut to enhance conditions for seed production; (2) an establishment cut to prepare the seedbed and to create a new age class; and (3) a removal cut to release established regeneration from competition with the over wood. Cutting may be done uniformly throughout the stand (Uniform Shelterwood), in groups or patches (Group Shelterwood), or in strips (Strip Shelterwood). As the uniform opening of canopy over the whole area of the compartment with a view to obtaining more less uniform regeneration. In this system regeneration of a compartment is started from natural foci or groups of advance growth or where such foci do not exist, by artificially created foci. Felling is done in strips and after a number of years enlarge the strips. According to the length of the regeneration period, the forest may be divided on the basis of age classes into what are known as Periodic Blocks. The preparatory cut is a thinning operation that gives selected trees room to grow large crowns. Trees with large crowns provide more seeds than trees with small crowns. A preparatory cut is only done if there is a shortage of trees with large crowns on the site. The first harvest is usually done when the trees are 60 to 80 years old. The seed cut removes about half the mature trees in the stand. It opens up the stand, allowing sunlight to reach the forest floor, where it stimulates the germination and growth of seedlings. The second harvest is usually done when the trees are 80 to 100 years old. The removal cut harvests all the mature trees. It can be done as a single harvest or as a series of partial harvests. The removal cut is conducted after a dense carpet of saplings (trees taller than 1.5 meters) is established in the shelter of the mature trees. By giving the saplings full sunlight, the removal cut encourages the rapid growth of a new forest. The final harvest is usually done when the trees are 100 to 120 years old. The Shelterwood system produces an even-aged, fast-growing forest. It favors mid-tolerant species, such as oak, white ash and white pine, which can germinate in shade but later require some sunshine to survive. This system can be adapted to quickly regenerate maple sugar bushes. This system is well-suited to mixed hardwood and conifer forests. The area where lack of sufficient natural regeneration to grow desired species. The Shelterwood system mimics major disturbances, like wind, fire, and insects, which create large gaps in the forest canopy where mid-tolerant species can grow. A method of regenerating an even-aged stand in which a new age class develops in a fully exposed microclimate after removal, in a single cubing, of all trees in the previous stand. Regeneration is from natural seeding, direct seeding, planted seedlings, and/or advance reproduction. Cutting may be done in groups or patches (Group or Patch Clearcutting), or in strips (Strip Clearcutting). In the Clearcutting System, the management unit or stand in which regeneration, growth, and yield are regulated consists of the individual clearcut stand (see Group Selection). When the primary source of regeneration is an advance reproduction, the preferred term is Overstory Removal. When the area is large you adopt the Block clear felling system for sustainable yield production. In this method, we divide the area into strips and the felling practice done in these strips. The area is divided as in the clear strip system but alternate strips are cut down in the felling time. All the trees are harvested in one cutting operation. In a modification of the clearcut system, called the “seed-tree method,” individual trees or groups of trees are left standing to provide seed for regeneration. The seed trees are large-crowned (capable of producing large quantities of seeds) and able to survive in windy, exposed conditions. You may need to thin the regenerating forest and protect the young trees from competition with other vegetation and from small mammals. Clearcutting produces an even-aged forest with trees that are about the same age. Although maple and other shade tolerant species can become established in clearcut areas, Clearcutting strongly favors the growth of shade-intolerant species, like jack pine, poplar, cedar and white birch. These species, which need full sunlight, grow fast and quickly dominate clearcut areas. Clearcutting is a good choice for the irrigated plantation and riverain forests, Where it gives little disturbance to the ecosystem. Clearcut system regenerates forest naturally to even-aged growth. Clearcutting is not recommended for general use in the mixed hardwood forests. a. The two stories high forest consist of a crop arrange in the different stories one above the other being approximately even aged and seedling origin as opposite to coppice. b. Natural two stories forest is found in Chirpine + Oak. c. In a plantation, Shisham and Mulberry are two stories. Mulberry is planted after Ist thinning. a. Limited applicability e.g. in the irrigated plantation. b. Where both the crop has not affected the growth of each other. a. In this system selected trees of the crop are retained for the whole rotation of the crop. b. These reserves help in the production of fine and large timber. c. Generally, this timber is produced for ships. b. Improvement Felling is carried out. 1. Remove the burnt and inferior trees. 2. Remove over mature, stunted tree to promote the growth of younger trees and to induce regeneration. c. Exploitable dia is not fixed. d. Mostly it coupled with selection system, in selection system exploitable dia is fixed. a. This simple system consisting of the clear felling of a fixed area annually which is regenerated by coppice. b. The system depends on the ability of the species to coppice. Sisso, Oak, Eucalyptus and most of the scrub species that coppice well. c. The rotation is small say 30 years. d. Tending is done right in the Ist years and continues. e. Thinning is done at the interval of 5 years. f. Artificial regeneration can be added to coppice area if desired. Those are generally of better species. 2. In irrigated areas of Punjab Eucalyptus plantation in the whole country, Prosopse spicegeria in Sindh. a. It is defined as Clearfelling with a frost protection over wood and regeneration by coppice. b. Before the main felling, standards 50-60 per acre are marked with coal tar. They are not but all other tree is felled. c. Demand for small wood. d. A rotation longer than ordinary coppice rotation. e. Reproduction from coppice is possible. 1. In this system, we retain the standard in the stand throughout the life of the crop. 2. How we distinguished it from Shelterwood system. In Shelterwood system standard are removed earlier. 3. The standards should not occupy more than 1/3rd of the canopy. 4. The over wood and Underwood should receive equal attention. 5. The standard should be formed regeneration light demander, good shaped and wind firm. 1. Punjab irrigated plantation (Changa Manga) standard are retained all over the compartments. 2. In Chichawatni, the standard is retained along roads and water channels. i. No clear felling is done. It follows the system of selection in high forest. ii. An exploitable size is fixed. Felling cycle is laid down. iii. At each felling cycle, only those trees are fell which have reached to exploitable size. iv. Type of forest Uneven aged crop. 1. In those areas where we avoid clear felling. 3. Applied in Olea Forest. 4. In Limestone region of Rawalpindi forest division. 5. In extreme xerophytic condition. The pollard system consists of removing exploitable material as under the simple coppice but by periodic pollarding instead of coppicing. Willow trees are so treated in England and Kashmir. The stacks so obtained are used for various purposes, e.g. sports like cricket bats. One advantage of pollards over coppice is that less damage from cattle. It means conversion of a forest from one Silviculture system to another. 1. The area is divided into as many equal coups. The conversion felling proceeds successively through these coups. 2. The crop should be young enough to coppice. 3. In older stock areas these must first be regenerated by seed before their conversion starts. Some old trees capable of giving seed can also be retained as standards. 1. Young age trees that have coppice, can be left to grow into larger trees. This system was done quite at large scale in India and Pakistan. In order to ensure the required gradation of age and sustainable yield, the area should be divided into conversion period, which should be equal to the rotation period of the principal species. The area is placed in various PBs according to their ages. The most mature one approaching rotation age would be placed to PB I and worked accordingly. 1. To all selection forests in coniferous species where uniform system suits the principal species and the terrain not too steep. 2. Chirpine, Deodar, Blue pine forest in NWFP, NAs, AJK, Murree, and Kahuta of Punjab. The suitability of the system to the principal species. The preservation and improvement of the local condition of soil and moisture. The resistance offers to external dangers. The safety and simplicity of a method of regeneration. The quality and quantity of produce. The intensity of management. (Low input low output, high input high output). Public rights on the forest. Choosing a Silviculture system isn’t easy. There are many factors to consider and many decisions to make. The most important ones are your personal goals, the condition of the stand today and your property’s potential. The following considerations and questions will help you choose a system. Many tree species can grow in a range of conditions. However, their growth and survival rates vary greatly with climate, bedrock type, and soil type. Assess your site to determine the tree species that are best suited to it. What forest region is your stand located in? What type of bedrock lies under the stand? How deep is the soil? What kind of soil is it? How much rain and snowfalls on the site? How hot does the site get in summer? What native species grow best in your area? Is the site so steep that cutting the forest will make it vulnerable to erosion that could damage the site and the nearby streams and rivers? The clear-cut system mimics natural disturbances, like forest fires, that kill extensive areas of forest, which regenerate naturally. Assessing the tree density, health and species composition of your forest will help you determine the volume and value of the trees in your forest and how much work you need to do to realize your goals. How big is the area that your stand covers? How many trees are in the stand? What species are present in the stand? How old and how big are the trees of each species? How many of the trees in your stand are most species, which provide fruit and nuts for wildlife? How many cavity trees and snags are there in your stand to provide nesting, denning, escaping and feeding holes for birds and mammals? Is there a carpet of organic matter and decaying wood on the ground to enrich the forest soil and provide habitat? Are there any tall pines poking through the canopy that should be preserved for their value as nesting and roosting sites for birds? The three Silviculture systems favor different species. Identifying the species you want to regenerate or grow will help you choose a system. If you want to regenerate shade intolerant species like poplars or cedar, choose the Clearcutting system, which provides the sunlight these species, need. If you want to regenerate mid-tolerant species like red oak or white pine, choose the Shelterwood system. If you want to regenerate tolerant species, like maples, beech or hemlock, or to maintain a forest with many different species, choose the selection system. What species do you need to regenerate to achieve your goals? What methods work best for regenerating your desired species? Are there sources of seed for natural regeneration in the present forest? Are there sources of seed for natural regeneration nearby? Can you regenerate desired species by stimulating coppice growth? Can you afford the time and costs of artificially regenerating the site by seeding or planting? Are you willing to weed or use mulches, fire or herbicides to hold back grasses and other plants that might compete with the regeneration? If you want a natural-looking forest that provides wildlife habitat, as well as continuous supplies of timber, fuelwood, maple syrup or other forest products, the selection system may be right for you and your land. While the costs of regeneration are low, the costs of tree marking and thinning can be significant. If you want to regenerate mid-tolerant species like oaks or quickly establish a new sugar bush, the Shelterwood system may be the best choice. By keeping a partial forest-canopy until regeneration is established, this system maintains wildlife habitat and does not increase the potential of erosion or fire. However, the costs of selecting and marking crop trees, tending and harvesting can be significant. If you want the fastest returns and/or to regenerate intolerant species like poplar, clearcutting may be the system you need. However, regenerating a clear-cut takes a long time and can be difficult and costly. Clear-cutting also removes the forest canopy which, in turn, reduces the diversity of habitat available to wildlife and makes the site more vulnerable to forest fires and erosion. Light Factors and its Importance in The Ecological Field.